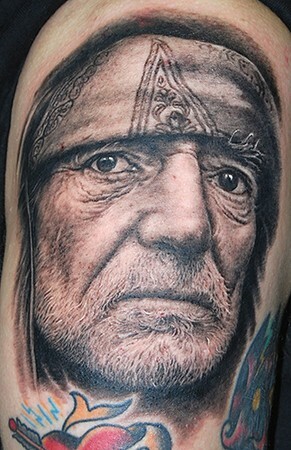 But since I’m not too keen on getting inked up, and since I do not care for living with jokes about having Willie between my legs for eternity, I’m left with little option but to show my adoration in other ways. Like by playing him on a new music focussed radio station in Sydney, in celebration of his recent arrest for marijuana possession. As the daughter of a massive stoner (don’t fret Ma, I don’t mean you!) I find Willie’s lifelong love affair with weed kind of endearing in my own creepy, Oedipal way. EEP. Oh dear, I think I just felt the collective shudder of my six horrified siblings. Anyhow, where was I? Willie Nelson, pot, arrested, released on bail, what a dreamboat…. I’m a bit sad that the outlaw was handcuffed this week. But like most Willie fans, kind of amused and just a little bit thrilled to find that he still goes On The Road Again with his stash. So sandwiched in between all the new releases on In The Pines tonight, I played this duet he recorded with Waylon Jennings many, many decades ago. Just over half a decade ago, I spent way too much time trapped in the musty, underground office of Sydney University’s student paper, Honi Soit. It was a strange and awkward year, not just because I spent most of it holed up in a two metre by two metre space with a bunch of bickering student politicians, aspiring Christopher Hitchens types and drama geeks, but because my aforementioned pot smoking father had recently died and I was doing my best to make Sylvia Plath look like Shirley Temple. You have no idea how happy I am to repeat that it was more than half a decade ago. I buried myself into two contradictory but complimentary tasks: editing the student paper with Ita Buttrose like dedication, and avoiding my university course work with a passion I’d previously reserved for poetry readings in the quad. Like I said, strange times. What’s the point of all this incessant over sharing, say you? It was in this miserable context that I first discovered Canadian musician Dan Bejar’s dream-fused melodramatic folk pop. His over-wrought, post structural masterpiece (Oh! To be back in a Cultural Studies tutorial!) Your Blues had been sent to the paper as a review copy. I snapped it up eagerly and for better or worse, listened obsessively as though his haunted, synthesised despair was my own. Many years, beers, tears and fortunately a whole lot of good, happy times later, Destroyer has returned to my stereo, this time in the form of tonight’s In The Pines playlist. Tonight we heard ‘Chinatown’ from the upcoming album Kaputt. I’m pleased to observe that despite his continuing association with the reasonably straight up New Pornographers, Dan Bejar still makes solo music of the decadent, sadcore variety. And equally pleased to discover he’s unafraid of the saxophone.